The Barbados Defence Force honoured exemplary service persons on Friday 2 November 2018 at a Medals Ceremony which was held in Lingwood Hall, St Ann’s Fort, Garrison St Michael. 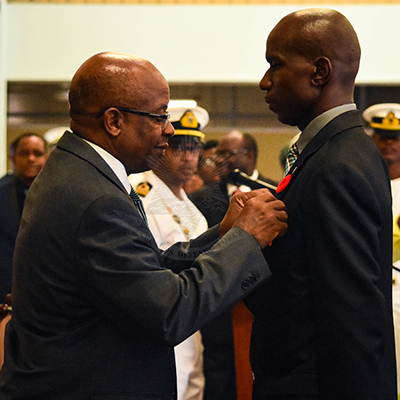 Acting Prime Minister, The Honourable George Payne Q.C., M.P., and the Attorney General, Minister of Legal Affairs and a member of the Barbados Defence Board, the Honourable Dale Marshall Q.C., M.P., attended and presented the Medals. While delivering the feature remarks, the Honourable Dale Marshall, emphasized that the servicepersons honoured, joined those elite members of the military the world over, who, through their actions and service, were deserving of recognition and thanks. He added, that the Barbadian public had seen and benefitted from the contributions of the Barbados Defence Force over its 39 years, in safeguarding Barbados’ interests from perils imposed by various threats and crises. The Meritorious Service Medal was awarded to Lieutenant Commander John Mapp while others received that General Service Medal for their contributions during the 2005 prison uprising. Other members of the Force received the Services Medal of Honour, the Efficiency Decoration, the Efficiency Medal (EM) and various Clasps.